A tourism delegation led by the Department of Culture and Tourism – Abu Dhabi (DCT Abu Dhabi) visited Kuwait last week to boost awareness about the emirate and increase inbound tourism from the GCC country. The delegation, which included partners Etihad Airways and Experience Hub, visited the capital Kuwait City to host a roadshow at the Radisson Blu hotel. Participating hotels, tour operators, wholesalers and attractions included Al Ain Zoo, Rixos Saadiyat, WebBeds, Dubai Expo 2020, Louvre Abu Dhabi, Jannah Hotels & Resorts, and Al Raha Beach Hotel. The event began with a networking session between Abu Dhabi stakeholders and representatives from the Kuwait travel trade before presentations were given by DCT Abu Dhabi, Etihad Airways, Yas Island (Experience Hub) and Expo 2020. There was also an additional part to the event, with the winners of the 2019 Abu Dhabi Awards presented with their prizes. 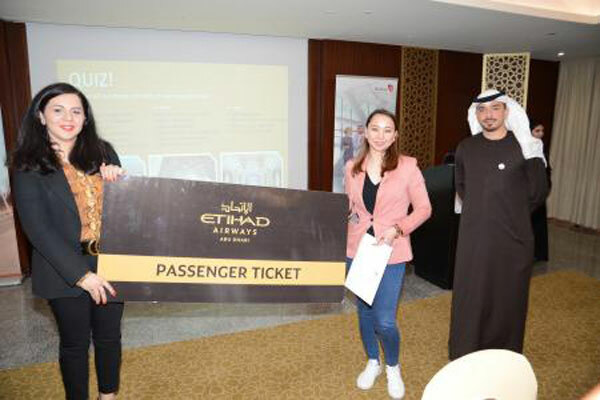 The awards, which were being held for the very first time, recognise the tour operators that are having the most success selling Abu Dhabi, with winners based on data collated from Etihad Airways and WebBeds. This year, Boodai Aviation and Al Salhiah World Travel & Tourism were the winning companies. The Awards were then followed by a dinner and a prize raffle draw. Kuwait is a crucial regional source market for Abu Dhabi, with the UAE capital looking to increase visitor numbers significantly. In addition to its luxury experiences and unique cultural attractions, the emirate is an especially attractive prospect for Kuwaiti nationals due to its close proximity. DCT Abu Dhabi has spearheaded a number of delegations to Kuwait with roadshows and promotional exhibitions. These initiatives have been effective in terms of meeting with stakeholders and exchanging knowledge, generating deals for the emirate’s national carrier, hotels, and destination management companies and raising Abu Dhabi’s profile as a destination of distinction amongst Kuwaiti travellers.